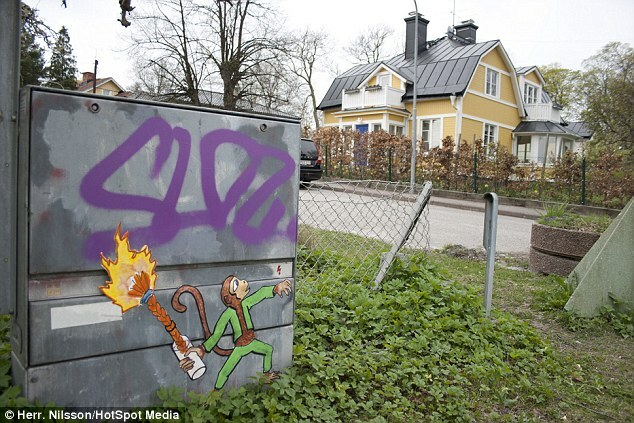 A year and a half ago, a new street artist started using the walls of Stockholm as his canvas. The street artist’s real name remains anonymous, but he is known as Herr Nilsson. Yes, this name might ring a bell amongst Pippi Longstocking fans, because it’s the name of the little mischievous monkey, Mr. Nilsson. The name also refers to his first known artwork, a monkey with a molotov cocktail in his hands. Since a couple of weeks now, he’s back in the spotlight, because the artist has been messing with the graphic identity of our good-old, good-natured Disney princesses. Drawing them on corner walls with guns and knives in their hands, with evil on their mind. However there is a moralizing idea behind the creation of these suddenly wicked princesses. It’s Herr Nilsson’s way to debunk stereotypes, because he finds our beloved cartoon characters – especially the female ones – too predictable. Because of my kids I’m surrounded by toys, games and movies at the moment. Of course there’s a lot of creativity in the toy and entertainment industries for children – but most of the cartoon characters, female in particular, are very stereotyped and predictable. Always so innocent, fair and harmless. The Dark Princesses are a comment on violence, but they are also a comment to how we look upon good and bad in the world. Everybody expects a fairytale princess to always look good and behave well. If I was one of them I would revolt after a couple of days. And in my world they do,” Nilsson said in an interview to The Local. His intentions may be pure, but his paintings aren’t granted a happily ever after like the characters they depict, because there’s a Zero Tolerance Policy against street art in Stockholm. A picture has to be removed within 24 hours. When asked if he would go back to exhibiting his work in designated spaces such as galleries, he says that his ideas don’t work there. I want to stage a situation where my artwork interacts with people on the street and the real environment, not a fictional environment in a gallery. When asked how he thinks the city should handle street art, his reply is inspiring and true for many street artists. He thinks their art should be treated and heard like a voice. Now only rich companies get the opportunity to speak out, because they can afford the advertisement space. Whilst they too should have the right to say what they want in the public space. This entry was tagged animal, art, Disney, fairytale characters, graphic, Herr Nilsson, interaction, monkey, public space, Stockholm, street art, Sweden, transformation, wall. Bookmark the permalink.